What’s On The Ballot For Everett, Washington Voters? No more connecting the lines, now you get to fill in the oval. Today the Snohomish County Auditor started mailing out ballots for the General Election. As a reminder MyEverettNews.com accepts political ads but does not endorse candidates or take positions on issues. We have provided links to the voter’s guide for the races listed here and also have provided a link to the Snohomish County Auditor’s Voter Information page at the end of this article. Everett City Council Position 4. This is a one-year-term that will be on the ballot again next November. It is to fill the unexpired term for the seat currently held by Ethel McNeal. She was appointed by the city council to fill the spot vacated by the election of Cassie Franklin to Mayor of Everett. McNeal ran in the primary but came in third behind first time candidates Tyler Rourke and Liz Vogeli. There are three ballot propositions on the ballot just for voters in the Everett city limits. The City Council has submitted to the voters five Charter amendments concerning Council elections. If approved, by amending Charter sections 2.1, 2.2, 2.3, 2.4 and 9.1, a specified number of the Council’s seven members would be elected within districts determined by an independent commission, and the other City Council members and Mayor would be elected citywide. Districts would be re-drawn following each ten-year federal Census. Council positions would have four-year terms, subject to certain transition provisions. Ballot title approved by the City Attorney’s Office (August 6, 2018). The City Council has submitted to the voters five Charter amendments concerning Council elections. If a majority of the City’s electors votes in favor of Proposition #1 so that a specified number of the Council’s seven members are to be elected within districts, then regardless of whether you voted “Approved” or “Rejected” on Proposition #1, should the number of Council Districts be five (“Option A”) or four (“Option B”)? The Everett City Council has adopted Ordinance No. 3608-18 concerning a property tax levy to maintain emergency medical services. If approved, this proposition would maintain existing service levels for emergency medical care and services, including paramedic services, by authorizing an increase in Everett’s emergency medical services property tax levy capacity to the previously-authorized rate of fifty cents ($0.50) per one thousand ($1,000) assessed valuation in 2019, and to increase the levy each year thereafter as allowed by Chapter 84.55 RCW. PUD Commissioner District 1. This is a race to fill a 2-year-term for the District 1 position on the PUD Board of Commissioners. The area that makes up District 1 includes Everett and also Marysville, Granite Falls, Darrington, Arlington and Stanwood along with the northern portion of unincorporated Snohomish County. Candidates are Sidney (Sid) Logan and Mary Rollins. 38th District – Senator. This is a 4-year-term in the State Senate. The 38th covers Everett, Marysville and Tulalip. John McCoy is the incumbent and Savio Pham is the challenger. 38th District – Representative. This is a 2-year-term in the State House. June Robinison is the incumbent and Bert Johnson is the challenger. U.S.Representative Congressional District 2. This is a 2-year-term in the United States Congress with Everett as the largest city represented in the District. Rick Larsen is the incumbent and Brian Luke is the challenger. The Snohomish County Council passed Ordinance No. 18-037 concerning an emergency communication systems and facilities sales and use tax. This proposition would authorize the imposition of a countywide sales and use tax, in addition to any other taxes authorized by law, of one tenth of one percent (0.1 % –10 cents for every $100) to be used for emergency communication systems and facilities, as authorized by RCW 82.14.420. 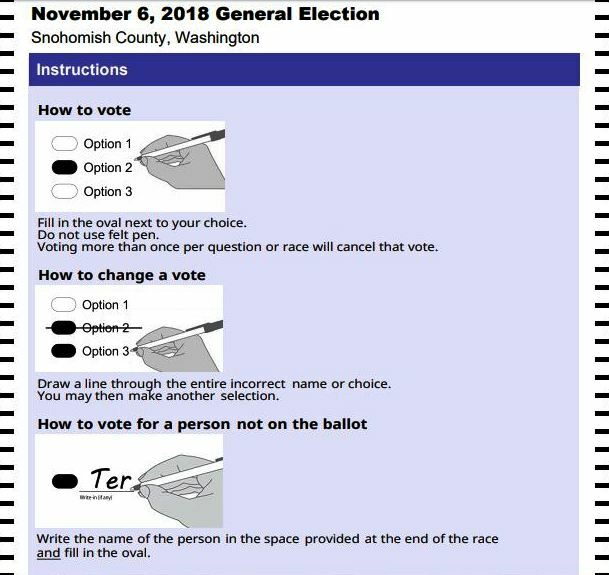 Ballot title approved by the Snohomish County Prosecutor’s Office (June 20, 2018). Again this election there is no need to put a stamp on your ballot the postage is pre-paid. If mailed the ballot does need to be postmarked on or before Election Day. Ballot drop boxes are still available in Everett outside the Everett Mall by Sears and Famous Daves and in front of the Snohomish County Courthouse at Wall and Rockefeller in downtown Everett, Washington. Questions? Here is the link to the Snohomish County Auditor’s elections page.